You know how there are a few random memories that stick around from childhood? Well, one of mine is my dad telling me about a really rich guy he knew. We pulled into the driveway of an average sized American home (probably even below average.) My dad looked up at the house and told me he knew a really wealthy man that lived in a house just like this one. He said this guy had so much money but he lived like he was poor. It was something he didn’t understand and the seven year old in me didn’t get it either. Why not buy a big, huge mansion like Minnesota’s famous Glensheen? (My childhood…and adult…obsession.) Now that I’m an adult, I understand why this man lived like this…so that he could stay wealthy and live simply. I can’t say for sure if he was one of the penny pinching people who hoard their cash or if he just chose to live a more simple life. I prefer to think the ladder. Our society these days doesn’t often see wealthy people living just like the rest of us; or does it? Do we walk amongst millionaires each day and have no idea because they decided to just be “regular” people? Probably. But the celebrity house tours only want to show you the $20 million dollar mansions. When walking the red carpet, most people are decked out in designers. These are the images we see the most. Wealth being used extravagantly. 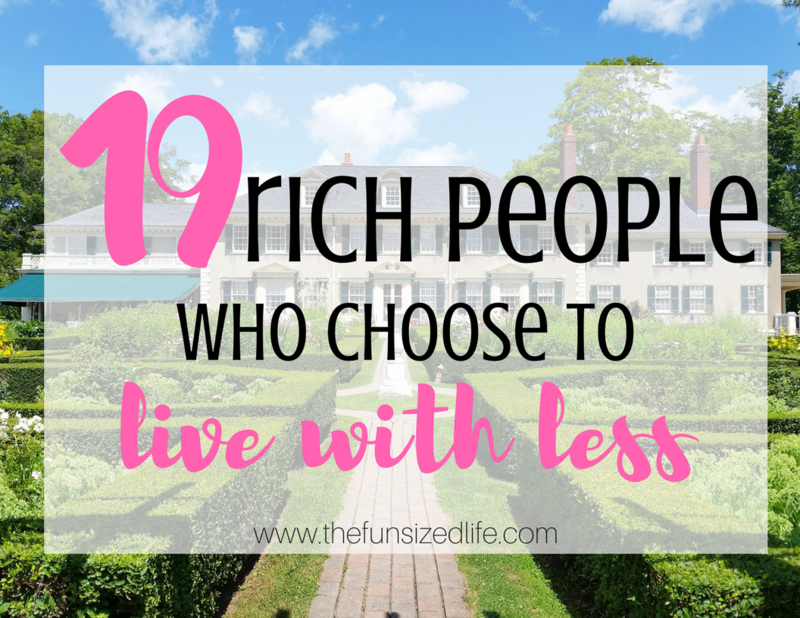 However, there are a big chunk of rich people who choose to live with less. Big names in Hollywood and beyond have made the choice to live simpler lives and use their money for better things. So let’s talk about these lesser known celebrities. Many of us heard about the “dress” already. While strolling down the red carpet, Kristen sported a $45 Target dress which is a pretty big deal in Hollywood. With her frugal lifestyle, she also makes huge efforts toward helping the environment. From begin fully vegan to biking as often as possible instead of taking her car. In fact, I read a magazine article where Kristen showed up to the interview right after hopping off her bike. This bike instead of walk thing is really catching on. In fact, Uber has started a whole new food delivery service and you can do it completely from your bike or scooter! Jay Leno has a famous collection of cars, but did you know he doesn’t actually spend any of his Tonight Show money? When he started the show, he made the choice to only live off the money he earned from his stand up appearances. This is wise if you are a 2 income household. Using one income to pay the bills and any additional income for some major savings to help you live comfortably and maybe even retire early! Yes, she has been a style icon for decades, but it’s pretty well known that Sarah Jessica Parker actually dresses her kids in hand-me-downs. Just like the rest of us, she doesn’t see the point in shelling out huge sums for clothes they will just grow out of and also doesn’t want them growing up with a sense of entitlement. You can do the same with the best online kids thrift store! Leo has been around Hollywood since he was a kid and has earned himself huge amounts of money. However, he’s also a huge advocate for the environment and frequently donates to charities that support it as well. He’s so devoted to supporting the environment and not over-spend, he only drives a Toyota Prius. If you are striving to be a bigger environmentalist, check out my post on how to reduce your carbon footprint. I’m not going to lie, I didn’t know a whole ton about Warren Buffet except for the fact that he is a well known simple living billionaire. Even after making his fortune, he continues to live in the same house he bought in 1950 for $31,500. He also lives his demanding life with no cell phone. When Bill Gates comes to visit (ya know, NBD) Warren drives to the airport to pick him up. When asked why he chose to keep life so simple, Warren has said he knows life would be worse if he had more to manage. –Smart guy. See his 3 easy steps to success. The founder of Facebook is doing pretty well financially although he claims that in his life he will give 99% of his earnings away. Despite his wealth and popularity, he continues to keep a minimalist lifestyle. This includes his wardrobe. In a job that already demands big decisions being made each day, the last thing he wants to worry about is what to wear. If you are ready to clear the clutter from your closet too, check out Decluttr. They make it super easy to do away with all things unnecessary and earn a little cash in the process! See the full Decluttr overview here. The late founder of IKEA lived out his years flying economy, eating at IKEA dinners and either driving his only car or riding the bus. .” After a major life evaluation, Tom walked away from his 17 million dollar mansion and moved into a trailer park that was within biking distance to work. Good ‘ol Jen feels no need to shop high end, fancy pants stores. Even after fame, she continues to shop for her and her children at regular retail shops just like the rest of us and has been known to hit up the sales as well! Wonder if she knows about all the rebate apps yet?! If you are the brains behind a huge company like Apple, you probably don’t have much time for extra clutter. Perhaps that’s why I love Apple so much myself? Everything is always just so clean and simple. Apparently, this is how Steve lived his life as well. In his bedroom, he had only a large photo of Einstein, a chair, lamp, and bed. He felt no need for added nonsense in his life. and Capital Gaines,) a new restaurant and a 5th baby on the way! Maintaining success can be tricky which is why they set some serious guidelines right from the beginning. Things like not allowing their children to be photographed and besides some minor clips, they do not appear on the show. When beginning to film their show, Fixer Upper they also made a strict limit to stick with only renovating local houses in order to stay close to home for their children. Hayden Christensen saw major success after landing the roll of Anakinn Skywalker, in the revamped Star Wars. In order to slow down his life, he relocated to his home town in Canada to live on a farm and grow his own veggies. I guess you could say, he wanted to get back to his roots. Wink, wink. Personally, I have failed repeatedly at gardening, but have huge success with my compost…so, that’s something. Right? More and more people are recognizing Keanu Reeves’s huge humanitarianism in the last few years. After his major success in the Matrix, he chose to give away 85% of his earnings and give them to the special effects and costume designers that were one the film. This makes sense as they are truly what made the Matrix so unique and such a huge hit. Halley Berry grew up with little, so she has a fear of losing all she’s gained. Because of this, she makes wiser choices like shopping for her own groceries and taking public transit. Even though the entire world is watching her and her style, this royal has felt no pressure to keep her wardrobe constantly updated. There has been plenty of talk about the fact that she wears outfits more than once. Oh my gosh, can you believe it!?! While there was some backlash, most of us mere mortals really loved seeing this far more normal side of her. This pretty woman tries to stay down to earth by sticking to her basic jeans and t-shirt wardrobe. She also grows her own veggies, knits her kids clothes and continues to aim for a simpler kind of life. Personally, I am terrible at gardening and knitting, BUT I ferment my own kombucha and yogurt at home. That’s something, right? A woman by my own heart. Tori chose to sell her mansion and relocate her and her children to a more modest bungalow where they grow their own fruit and veggies. If you are a mama like this who chooses to only feed your kids the best and healthiest foods, check out UrthBox for the best healthiest foods sent right to your door. She wrote the Harry Potter books quietly in her free time, why wouldn’t she continue her life after Harry Potter the same way? Quietly and modestly JK Rowling goes by her husband’s last name and works to stay away from the spotlight, despite her huge financial success from the Harry Potter series. On top of avoiding the spotlight, JK makes generous donations to charities with her earnings. –If you have ever considered writing your own book, make sure you have all the answers on how to get started! Who knows, maybe you could be living famously incognito someday too! Remember the huge deal people made when Lady Gaga had a teeny, tiny, belly while performing at the Super Bowl in 2017? Well, that’s because she’s a normal person who enjoys pizza, pasta and all things fabulous. And just like Jennifer Garner, she’s not afraid to shop the sales! It’s true, these celebrities still probably live a whole lot different than most of us, but it’s still cool to know they make major efforts to keep life simple and minimal. Here are some of my best posts to help you do the same! Minimalism for Beginners. Mistakes to Avoid.